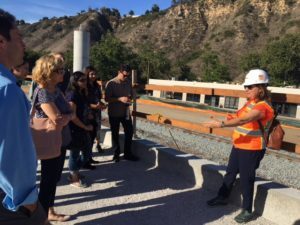 On Friday, May 4, 2018, the Young Planner’s Group (YPG) Mentorship Program participants received an amazing tour of the Mid-Coast Trolley Extension project led by Sharon Humphreys, SANDAG’s principal engineer for the massive undertaking. With initial plans drawn in 1995, construction beginning in 2016, and service commencing in 2021, the Mid-Coast Trolley Extension, as it is aptly called, will extend light rail Trolley service from Old Town to Westfield UTC, stopping at major destinations including the VA Medical Center, UC San Diego, and Westfield UTC. SANDAG estimates that the new trolley service will attract about 20,000 new transit riders, alleviate peak congestion along the I-5 corridor, and reduce 137,000 vehicle miles traveled. The largest and most expensive capital project SANDAG has ever undertaken with a price tag of $2.1 billion, the Mid-Coast Trolley Extension is 11 miles. The sheer magnitude of the project became abundantly clear as we, YPG Mentorship Program Participants, listened not only to Sharon, who explained the engineering challenges and considerations the project provokes, but also to Kiran Kaur, a SANDAG environmental planner, who detailed the care and precision with which SANDAG performs on-site and off-site environmental mitigation. As we walked north from the SANDAG field office along Rose Canyon to witness the steep embankments and a myriad of concrete pillars at the I-5 and I-52 interchange, Sharon stopped us to share how these topological constraints were not only vexing to the project’s engineers, but also how they typify what engineers and planners encounter and the ingenuity that is required in planning and design. The narrow corridor already contains the Rose Canyon Creek, a bike path, one heavy rail line, and freeway pillars. Sharon explained that the engineers were then tasked with fitting in two light rail tracks and an additional heavy rail track within an environmentally sensitive area, between concrete pillars, and inside the same narrow corridor. On top of that, in just this section, the project had to be designed to contend with a major fault line as well as potential flooding that could arise in Rose Creek. 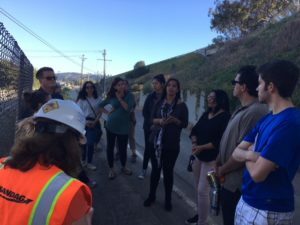 Kiran expounded on the environmental challenges in Rose Canyon section, noting how SANDAG is responsible for taking an inventory of all endangered species within 500 feet of the project’s footprint and mitigating for any potential impact the project may have to the species or their habitat. 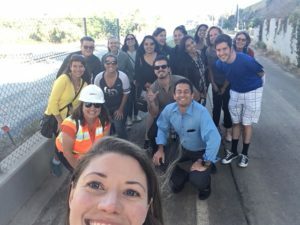 For example, because the California Gnatcatcher is an endangered species that is known to have a presence in the Rose Canyon area, it is incumbent upon SANDAG to mitigate for any loss of its habitat resulting from the project. In addition to mitigating for any habitat loss, SANDAG is required to monitor any potential nests to ensure the project construction is not harming the endangered species. Kiran stated that SANDAG hired a biologist just to monitor these endangered species’ nests in this section. As you can probably tell from this granular detail, the tour was informative, interesting, and illustrious of many planning issues, yet it also showcased engineering ingenuity, 20-plus years of planning, robust collaboration among different jurisdictions, agencies, and stakeholder groups, and an attention to detail that is required for the project’s success. 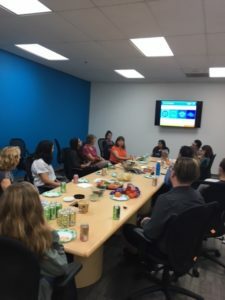 As a mentee in the YPG’s Mentorship Prog ram, I thank the mentors who suggested the idea and Sharon and Kiran for leading us on a wonderful tour of a fantastic project! The bonus was our fun concluding happy hour at Karl Strauss!